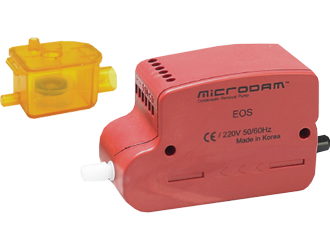 EOS - electromagnetic piston pump specially designed for installation in the ceiling void near the wall air conditioner. Low noise and vibration-absorbing system. Waterproof float made of plastic. Built-in check valve to prevent back-flows. Power supply: 110 ~ 120V 60Hz or 220 ~ 240V 50/60Hz. Water flow rate: Max. 10l/h at Zero head. Ambient temperature: 0 °C to 50°C. Thermal protection: cut-out at 100°C.